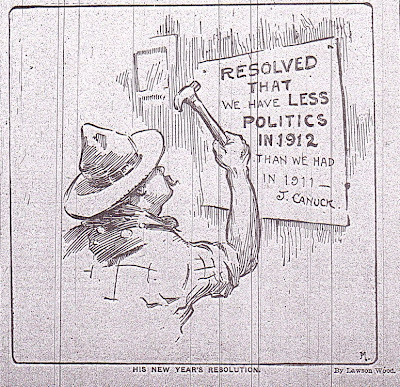 Leo P. Dowd caricatured Miss Canada in a toque for a 1912 cover cartoon. The numerous Canadian Comic journals were fond of Johnny. Pick, Sprite, Grip, the Moon and Saturday Night all featured him at one time or another and he was a favorite of newspaper cartoonists from the Toronto Telegram to the Winnipeg Free Press, where Arch Dale, of Doo Dads fame dusted him off for a prairie audience in the thirties. During WWII he fought the Nazis in one of the ‘whites,’ in Dime Comics No. 1, February 1942, Leo Bachle script and art. 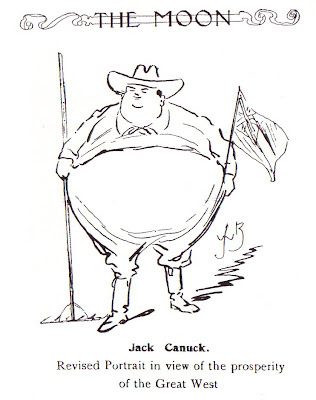 The Readers Encyclopedia, 1948, Thomas Y. Crowell Company says (erroneously in my view) Canucks was a name given by U.S. to Canadians; although I have no proof I believe J. Walker was the originator, or at least popularizer of the nickname. 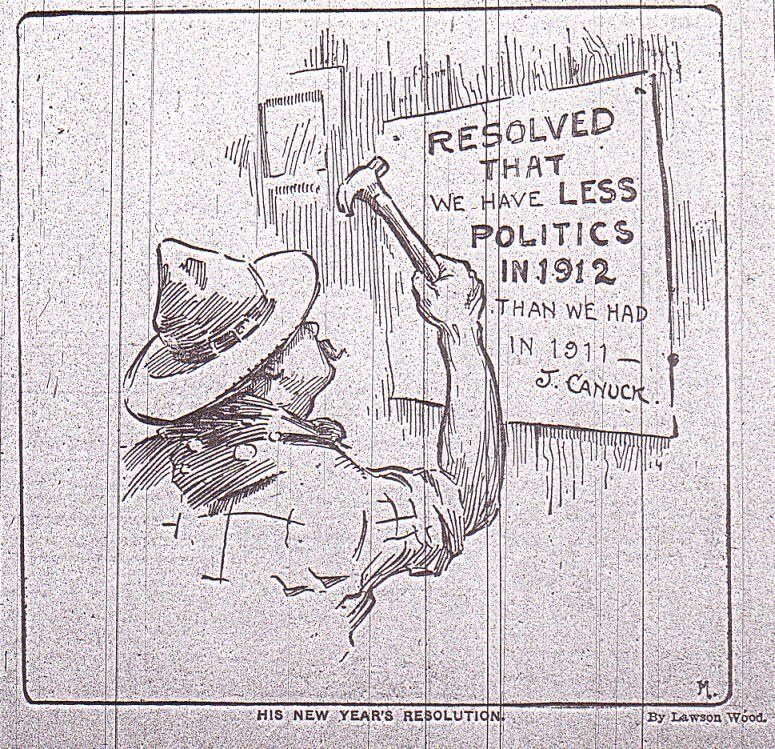 Canadians do not generally take the nom de plume as an insult. 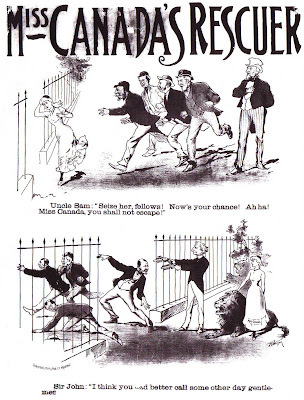 Miss Canada had appeared as early as 1870 in the Canadian Illustrated News, Miss Canada was a symbol of virtue and morality for the Victorians and Edwardians usually pictured as a Greek Goddess, Britannia or Columbia. She would later adopt the name of Janey Canuck. Occasionally she was pictured as a pretty Indian princess although natives were, and still are, treated abominably by Canadians. Brother Jonathan was the name given by Americans to New Englanders, referring to the governor of the state of Connecticut, Jonathan Trumbull. 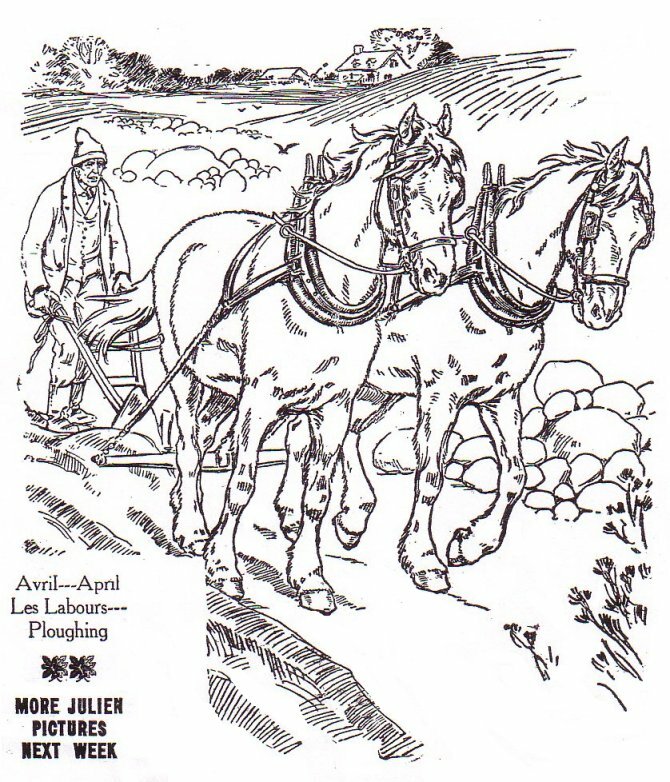 The name was also given to a popular story paper. 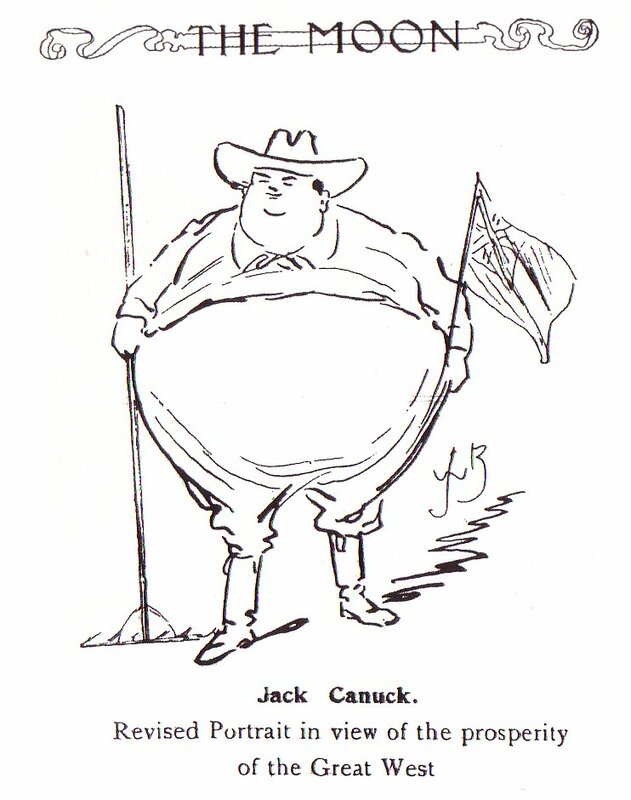 In Canada and (I think) England, he was known as `Cousin Jonathan,' then metamorphosed into Uncle Sam. Off-topic, Uncle Sam's ice-box referred to Alaska and Uncle Sam's heel was Florida. Uncle Sam was, of course, a clever use of the initials U. S. and legend dates it from the Revolutionary War and the War of 1812. 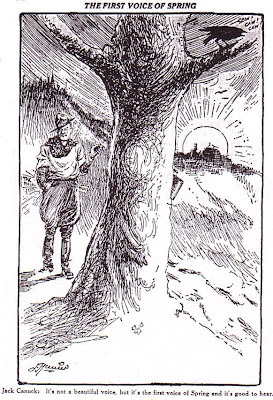 There was also the phrase “Nunky pays for all,” a joke amongst U.S. soldiers. 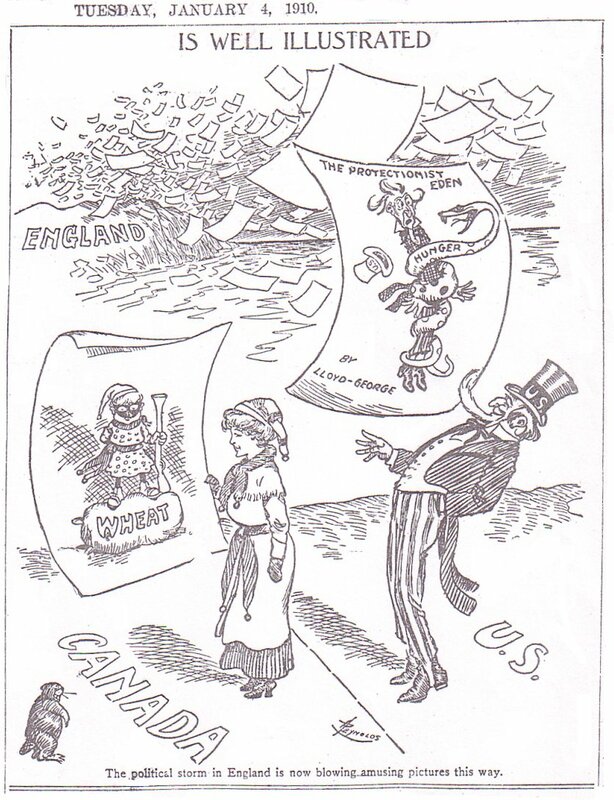 Uncle Sam was used by American cartoonists both glowingly and critically. 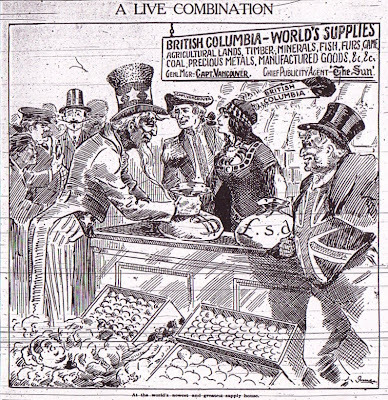 It is interesting to see the use of Uncle Sam (both for and against) in Canada, Britain, and the rest of the world. During the American-Spanish and American-Philippine Wars, the cartoonists of Cuba, Mexico, and Manila pictured Uncle Sam in less than glowing terms. 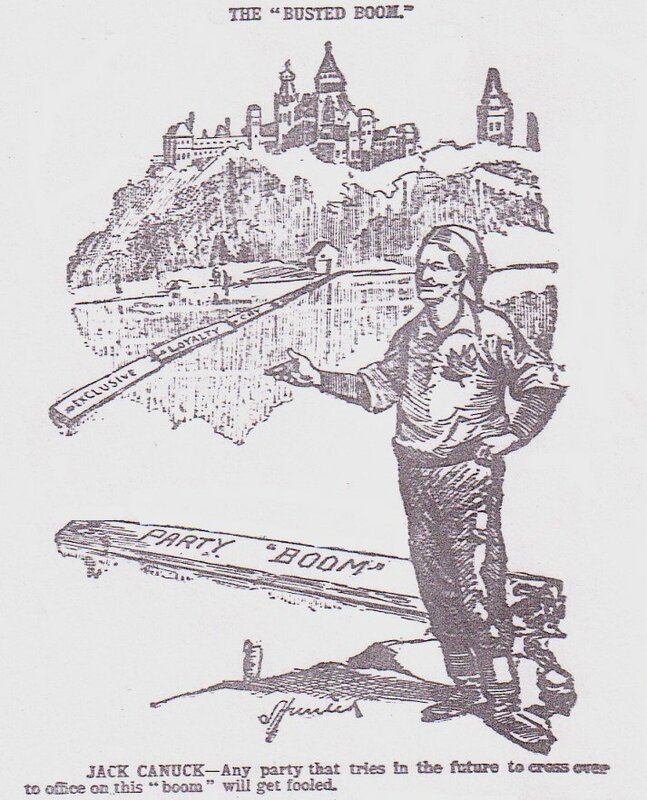 In Canada he was usually shown as slightly seedy and disreputable, whittling, slouching, and smoking lo-o-o-o-ng cigars (probably picked up in his Cuban adventures.) In the early part of the century he was welcomed in the West as Canada looked for settlers and castigated in the east in the pages of the scurrilous Moon. 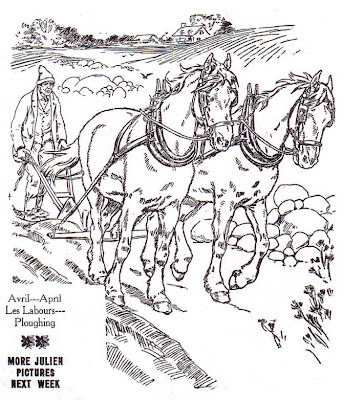 John Bull was the national nickname for the Englishman, usually pictured with a bull-dog. 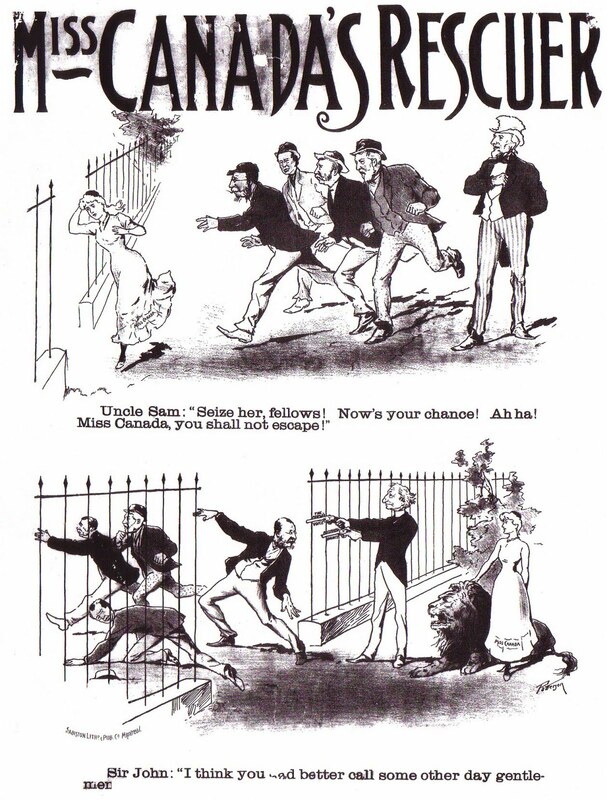 The character was derived from a 1712 satire, The History of John Bull, by Dr. Arbuthnot, the original title was ‘Law is a Bottomless Pit.’ Arbuthnot called the Frenchman ‘Lewis Baboon’ and the Dutchman ‘Nicholas Frog.’ There was a Nineteenth century journal, John Bull, and a 1906 British Weekly with the same title. Frog was also used (and is still used) as a taunt at both French- Canadians, and, in England a taunt at the cross-channel neighbors’. Napoleon was used by nannies as a bogle-man or bugbear to scare the wee ones to sleep. Astoundingly, the British Press still calls the French “frogs” in print to this day. I saw it used with no regret in an article only last week.